Can you confirm these amateur observations of Typhlophis squamosus? ayarzaguenai: Venezuela (Bolivar, Los Pijiguaos); Type locality: Serranía de los Pijiguaos, Area Bauxiven, Estado Bolívar, Venezuela. Types Holotype: RMNH, according to Gray (1845:136); however, Hahn (1980:5) stated the holotype was MNHN and is now lost. The specimen in RMNH has a hand-written note saying that it may be Typhlops septemstriatus or its type). 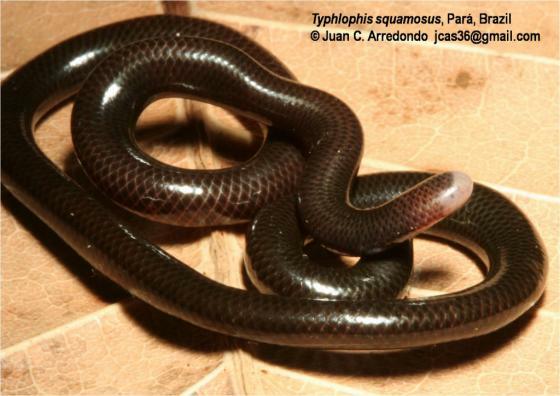 Comment KOK & RIVAS (2008) synonymized Typhlophis ayarzaguenai with Typhlophis squamosus. Type species: Typhlops squamosus SCHLEGEL 1839 is the type species of the genus Typhlophis FITZINGER 1843. Typhlops squamosus was described by Schlegel (1839) and characterized by the head being covered by small scales indistinguishable from those of the rest of the body. Based on this same characteristic Fitzinger (1843) proposed a new genus for this species: Typhlophis. According to the original description T. squamosus has 345 ventral scales, 14 subcaudals and 21 rows of mid-body scales, while Boulenger (1893) raised the number of mid-body scales to 24 and mentioned that this species measures 130 mm [from SEÑARIS 1998].